Other than basic health and wellbeing, nothing is more important for dogs than their puppy development. Positive development occurs when pups grow up in a stimulating environment with care, individual attention and one on one time with people. When started at an early age pups learn how to learn, to seek and to find. Natural talents are reinforced and energy directed in a positive manner during development training. As puppies exhibit a lot of emotion, it is important for them to learn at an early age how to control their emotions. An adult retriever who sits steady for birds, delivers birds gently, gets into cover or water when told, watches the marks and handles through scent is under emotional control. 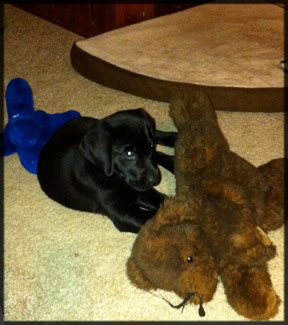 We accept pups for training as young as seven weeks of age. At this time individuals have had as much interaction with their littermates as desired in regards to their place in the litter. We find dominant pups become dominant/aggressive and submissive pups become submissive/fearful if not separated from each other after seven weeks of age. It’s time to join the human pack! 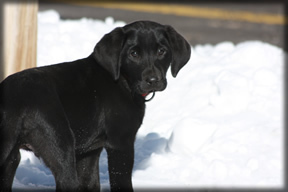 Puppy development is an individual process and all pups mature at slightly different rates. Pups are a lot of work and have definite lessons to learn in regards to both work and play. 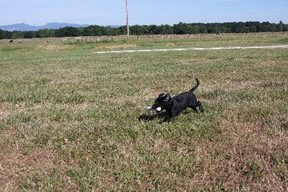 Our pups in training from 7 weeks of age through 5 months of age progress through important stages of development as they retrieve toys, explore on walks, socialize with people, discover birds, master crate training, learn to travel, begin basic obedience, retrieve singles and doubles all enabling the pups’ desire for more. Price is $720 per month and includes boarding, feed and training. Puppies do not forget their people. It is not necessary for you to raise your pup to establish a bond. If owners are unable to provide an environment for their pup as described above where positive development occurs we strongly suggest owners send their pups to us for this period. Your pup will not forget you!